There are so many questions in Indian Country and often, we are our own worst enemies. Some Natives say to other Natives that if you don’t speak your language, you don’t know your tribal culture or worse yet that you’re not even Native. So, I wonder—if we understand and shape our world via language and there are no living Chickasaws that understand the world through only the Chickasaw language—what does this mean for our culture and identity as Chickasaws? 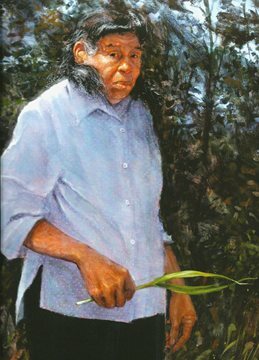 A portrait of Chickasaw Elder Emily Dickerson painted by artist Mike Larsen. Dickerson recently waled on and was the last monolingual speaker of Chickasaw. I am very humbled to be part of the Chickasaw Nation and I am constantly in awe and amazement of the programs that the Nation provides for the Chickasaw tribal members. One of the prominent programs is the Chickasaw Language Revitalization Program run by Joshua Hinson. Under his direction, the Nation has created Anompa an iPhone app (and accompanying desktop app), they stream language lesson videos (for those of us who don’t live inside the Nation), and they offer immersion programs in the Nation for both youth and adults. Additionally, there are workbooks, CDs with lessons, and several dictionaries. Sadly, if you’re not in the Nation it’s much harder to stay motivated to learn a language, when you’re not immersed in the language (I know this from both personal experience and colleagues who teach tribal language immersion). In my experience, the workbooks books lay on the desk, but don’t always get opened. The videos are on the computer, but you’re tired after work so you don’t log on. In graduate school, I could have chosen the Chickasaw to meet my language requirement for the program (I was in the American Indian Studies Program at the University of Arizona). But, with no one to teach me and only a workbook at that time, in the end I was able to meet the requirement because of my undergraduate Spanish. So I opted out of learning Chickasaw. Now, having read the story of the passing of the last monolingual speaker of Chickasaw and learning that only about 70 people are fluent at all in the language, I feel like it is my responsibility to learn the language. I want my worldview to be reshaped by my tribal language. In the end, maybe that is the key. Cultures are always changing and adapting. Natives are great adapters or we wouldn’t still be here. So, with Emily Johnson Dickerson’s passing, we’ll adapt as Chickasaws. And those of us who learn the language will reshape our existing worldview as our culture is opened up through the Chickasaw language. This is what it means to be Chickasaw.